While smartphones have made modern life more convenient and improved communication, they are known to be power hogs. In fact, some units will literally require being changed several times a day. And when you are outdoors, traveling or away from a power source, this may be impossible and you may be shutout from the world. Well, you shouldn’t. What you need is a power bank. This accessory offers you on-demand power whenever you want it. It comes with a large capacity that allows you to charge the smartphone several times before it needs to be recharged. 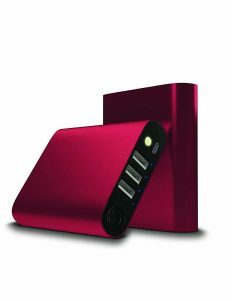 Prior to analyzing the top 10 best portable power banks in 2019, do you know what features are the most important? Read on to find out. Capacity : This is the amount of power the unit provides. It generally ranges from 2,000 to 26,000 mAh and the larger the rating the many the cycles it offers. Ports : Good items come with multiple ports that allow several devices to be charged at the same time. They usually come with the standard USB port. Weight : Good portability is guaranteed if the unit is lightweight, small and compact. A top device also comes with a slim profile that easily slips in the pocket, purse or bag. Cables : A USB to Micro-USB cord is standard in the market. Nonetheless, some accessories will feature extra cables such as USB-C connector or lighting cable for certain phones or devices. Power Input : This is the current drawn by the unit and ranges from 1 to 2.4 amps. The higher the figure the faster it will recharge. Safety: It’s critical to look the safety features that include Over Current, Over Voltage, Over Discharge and Charge Protection. 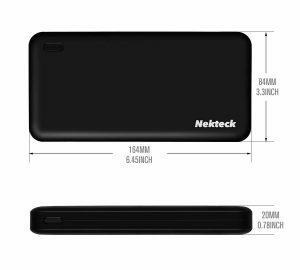 Starting us off is this black power bank by Nekteck that is rated at 20,000mAh. It comes with a decent and easy-to-carry weight of 12.64 ounces and a space-saving dimension of 6.34 x 0.83 x 3.27 inches. The accessory charges relatively fast despite its large capacity and is rated at 3.4 amperes. It can support two devices at the same time courtesy of the two USB ports. Its main pros include fast charging, lightweight, decent power, and good safety courtesy of the smart IC technology. Some consumers nonetheless complain that it takes quite some time to recharge. Are you the type who can’t seem to get enough of power-draining apps like Snapchat and Pokémon Go? Thankfully, you have this high capacity battery, slim design power bank with lots of ports so you’ll not have to worry about dead batteries. With 1.5 inches of thickness is comfortable enough in your back pocket so you don’t have to worry about portability. Three 2.5A US ports are dedicated to converting the 10400 mAh into at least 4 full charges for your phone. So you’ll have no problem charging your iPad, iPhone, and iPod all at the same time. Your safety is well taken care of, the premium battery cells the company has uses have been tested and UL certified. There are multiple colors to choose from too. 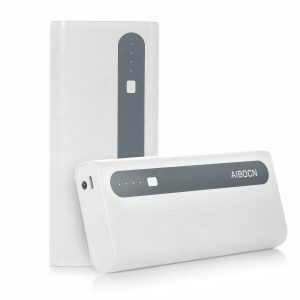 Rated 10,000mAh and coming with 2 USB points (2.1A, 1.0A), this white-grey power bank by Aibocn is fit for smartphone and some mini tablets. It measures 6.8 x 4.2 x 1.3 inches and occupies little space. Carrying it isn’t a problem as it only weighs 10.4 ounces. The unit comes with a built-in flashlight, Intelligent Safety Protection that prevents overcharging, undercharging, short-circuiting, over discharging or too much voltage or current. It ranks among the best because it’s very portable, simple and slim design and good charging speed. The power bank, unfortunately, isn’t designed for devices that draw high current for instance tablets. Recharging your smartphone when away from a power outlet shouldn’t be a problem. 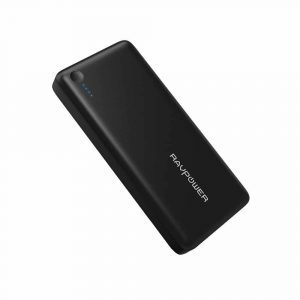 With the RAVPower battery pack, you get up to 22,000 mAh and a maximum 5volts. The unit features 3 USB ports that deliver up to 5.8 Amps with each port rated 2.4A max. It measures 6.5 x 0.94 x 2.76 inches and comes in a space-saving box shape. The black power bank is loved for its high capacity, multiple ports, easy to use and good construction. However, with a weight of 14.4 ounces, it’s not the lightest. People also say it takes considerable time to recharge. 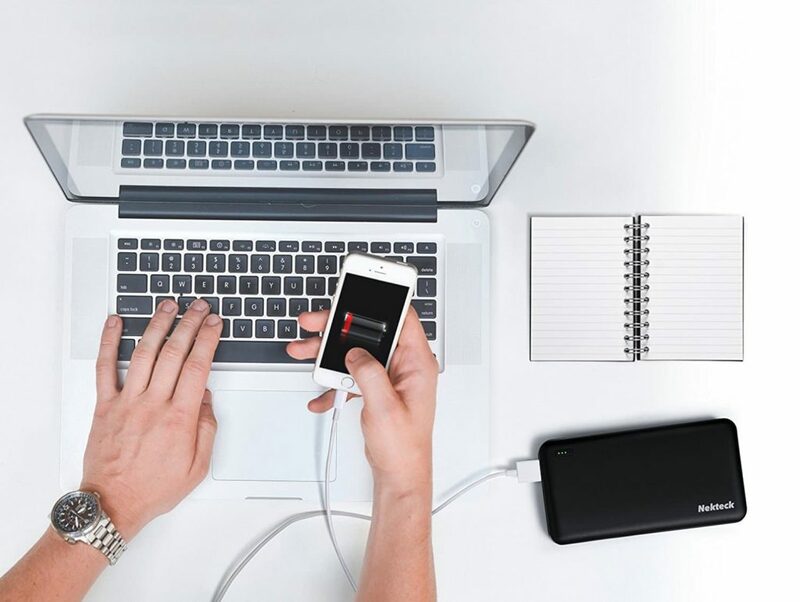 If you want lots of backup power, you should choose the RAVPower Powerbank. The monster unit measures 6.77 x 3.15 x 0.79 inches, weighs 1.01 pounds and is black in color. It has a capacity of 26800mAh, making it the most powerful on our list, and a total current/amperage of 5.5Amps. However, each of the 3 USB ports gives a maximum of 2.4A. It features a lithium-polymer battery that will deliver power for as many as 9 days and requires 13 -15 days to fully recharge. While they like the high capacity, solid construction, and safety features, consumers say its relatively heavy and recharging takes long. 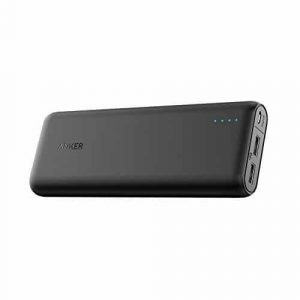 Although small (3.62 x 2.36 x 0.87 inches) and lightweight (6.35 ounces/ 180g), this black power bank by Anker delivers up to 10,000 mAh. 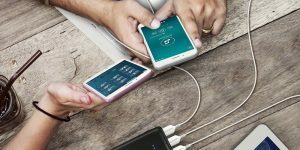 It easily recharges smartphone within a short time courtesy of the high-speed charging technology and single 5V/2.4A port. The unit’s compact size and shape make carrying easy and also takes up minimal space on the desk, pocket or purse. This portable lightweight power bank will save you the disgrace of your battery dying in the middle of a phone call with 3 full charges of any mobile phone. Boasting a staggering 10000 mAh of power, it is slim as an iPhone, easy to slip into your pocket when you are out and about. The pair of USB ports (2.1A and 1A) take advantage of the smart IC to deliver a fast yet secure charge. No need for a separate spotlight! This handy power bank features an LED light that works perfectly well, you only need to double click the power button and you’ll be good to go. At a mere 7.04 Oz and 0.37” thickness, you should be able to take this pocket-sized device around with you and not feel weighed down while still having sufficient power for any of your devices. 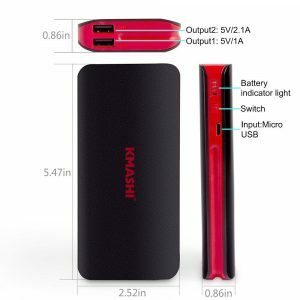 Rated 10,000mAh, the black KMASHI power bank will come handy when your smartphone is running low on charge. It’s very easy to carry thanks to its light weight of 9.76 and space-saving size of 5.47 x 2.52 x 0.86 inches. It features a builtin lithium-ion battery that delivers power via the two output ports (2.1A, 1.0A) each rated 5 volts. The unit requires about 6.5 hours recharging when drained. Other than the lightweight, compact nature, and user-friendly LEDs, people love the cool and sleek varnish finish. The unit, unfortunately, doesn’t come with a 5V adapter. 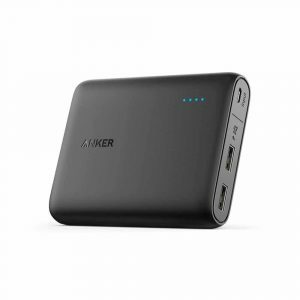 Although it only weighs approximately 12 ounces, this black Anker power bank will recharge you Samsung Galaxy, iPad, iPhone or any other phone. It comes with a 20100mAh capacity and a 4.8A output. 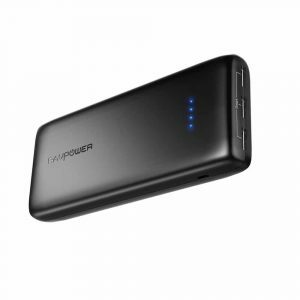 The ultra-high capacity power bank can serve you for as many as 7 days before needing about 10 hours to recharge. 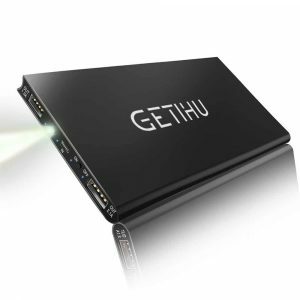 To support two devices simultaneously, it has dual US ports and occupies little space thanks to its size of 6.64 x 2.28 x 0.87 inches. Consumers appreciate its high capacity, good construction, and it doesn’t get hot. They would, however, have loved if it came with a Lightning cable for iPad or iPhone. 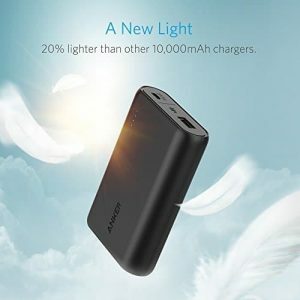 There are several explanations why this black Anker powerbank is on this list. First, it’s very light (8.92 ounces) and also portable (3.8 x 3.2 x 0.9 inches) and carrying won’t be a problem. Secondly, its good capacity of 13000mAh and 3.0A can support most smartphones. Thirdly, the 2 ports can charge two different devices at the same. Four, The VolatgeBoost and PowerIQ improve the charging speed and safety. The only issue is that it misses a Lightning cable. Now you have the list of the top 10 best portable power banks in 2019. Any item on this review should serve you well and for a long time. The accessories are built for day-to-day usage, can withstand regular charging, offer many cycles, and boast of a durable and efficient battery. It’s upon you to make the right choice by clicking on the product that you find the most appealing. And if you don’t mind, kindly let us know which it is and why you chose it.